I stumbled onto this drama, because of the cast. Mainly drawn to Feng Shao Feng's acting, I started watching it. Even though there has been already 50 episodes released, you can still jump on the ride if you are still on the fence. 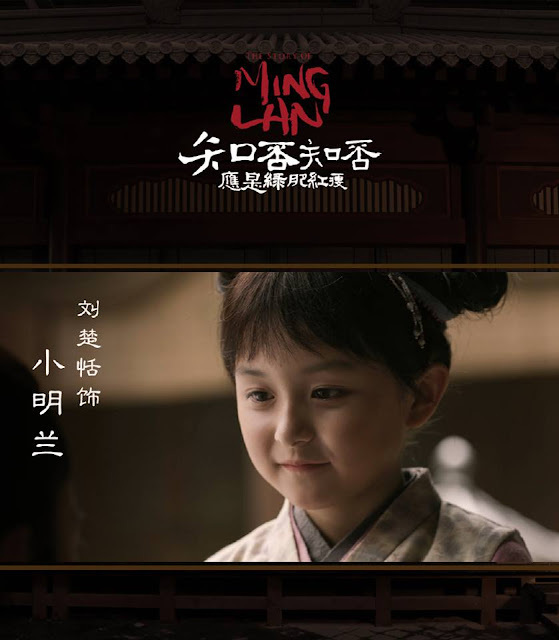 Sheng Ming Lan (Zhao Li Ying) has been mistreated by her legal mother and half siblings her whole life after her mother's death. Although she is the daughter of an official, she is the sixth child, and is often looked down on despite her beauty and intelligence. Throughout her years of suffering, she decides to devise a plan to avenge her mother's death. In order to do so, she must be patient and hide her true intentions from everyone else in the dynasty. One day, Ming Lan, meets Gu Ting Ye (Feng Shao Feng), the hedonistic son of the Marquis of Ningyuan. They fall in love and over the years their relationship leads to marriage. As a power couple working towards the same goals, can they avenge Ming Lan's mother's death? The Story of Ming Lan 知否知否应是绿肥红瘦 is a 2018-2019 Chinese Drama adapted from the novel "Don't You Know". Here we go for my first impression of this drama. The first episode sets up the rough relationship filled with belittling and scheming between Ming Lan's mother and her status in the Sheng family. Inherently, Ming Lan (Zhao Li Ying) is affected. 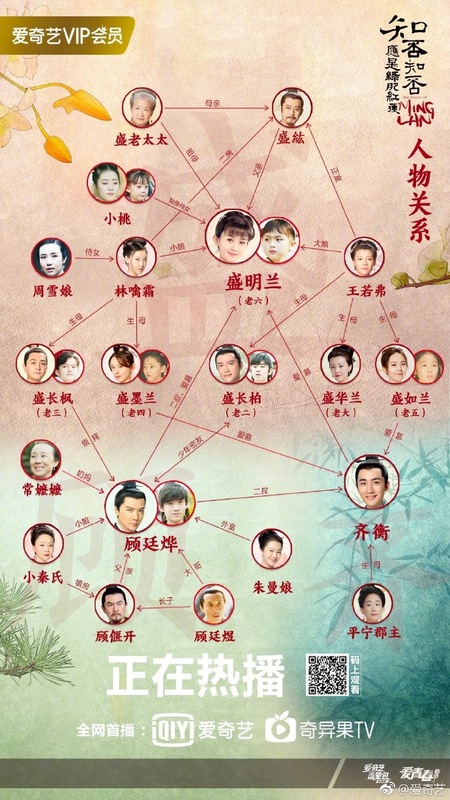 It also sets up the premise and significance of marriage between families of prestige, starting with Yuan family making an extravagant proposal for the hand in marriage to Sheng family's first-born daughter. One thing to note for enjoyment of this drama for what it is is the importance of reputation. Personally, I had a bit of difficulty following the relationships, titles, and names within the families based on the first episode. Without continued watching further into the series, this drama most likely wouldn't have been on my radar, or I would have dropped it. I gave it the benefit of the doubt with some fast-forwarding to a more recent episode to keep my interest in the story. This drama boasts strong character background and development for the main characters and supporting characters by starting from the beginning of childhood. The strong cast doesn't fail to disappoint to bring the characters within the historical context to life. I'd give a review of the main actors' acting, but they actually don't appear until a couple of episodes in- like at least past three episodes. Ming Lan (Zhao Li Ying) left. Gu Ting Ye (Feng Shao Feng) right. The story follows theses two characters from childhood starting in episode 1. From the storytelling aspect, it can feel like a drag with the lengthy conversations and extra shots. If you're looking for a flashy, fast-paced drama with a soundtrack to go with it, then this is probably a drama that you can skip. There are some high-stake scenes, but you'll have to take into consideration the context and step into the shoes of the character to potentially be invested in this drama. Qi Heng (Zhu Yi Long) as a supporting actor and potential love-interest of Ming Lan. One thing I appreciate about this drama is the efforts in the background to prepare this drama that runs 79 episodes. I think every scene in this drama has a purpose to move the story a long, but you'll have to be patient as the producer/director will spend several episodes on one character's story then cut to another character's story before bringing both character's decisions together to show how they are intertwined. This is my first impression of the drama. I'll keep watching this drama for the story and the acting. Although I might just wait until all the episodes are out. I tried catching the first episode too, but just couldn't hold my attention long enough for continued watching. The pace is slow, and the plot seems to develop in a minimalist way, which I find not at all effective for storytelling to a time-conscious audience. I don't mind long dramas going over 35+ episodes, but let each episode make absolute progress in the development of a story, and not drag. If in 1 - 3 episodes you can't get to the main characters, or make people care or curious about the main characters, then it's too easy to jump ship and go elsewhere. Just like The Elements of Style and that every word counts, so does each scene in the movement of the story. Details are necessary but it must come at the right pace and quantity, and that is why it takes talent in script writing to strike a good balance. Dream of the Red Chamber was kind of slow but totally NOT as slow as Ming Lan. I have not seen them ridiculously do a 43min + 43min + 43min + 43min (total of 4 damn episodes) just to show that a little girl and her mother has some haters so they kill the mother. Even Yumama understands that concept and finish a simple scene like that within the first 15 minutes of Hao Lan. Is the Ming Lan novel really ridiculous like that too? The first 4 chapters are only about that or what? Because I'm sure a few sentences would have done the job perfectly. If the novel isn't like that, I really wonder how the novel fans feel? In Dream of the Red Chamber, every chapters have meaningful storyline and culture to it that's why it is a classic. Then, in the drama version, they directed it chapter by chapter. Also, all the actors professionally acted as if they were people in the olden days. They walk gently and correctly. The decorations were so unbeatable too, no matter how much CGI people are using today they cannot compare to the real authentic feel of those old decorations. I love this drama. I was on the fence when I first started it because of the slow pacing but this is more like a slice-of-life drama that heavily relies on it's story and it's actors. It gets addictive once you get past ep 23. I never knew that slice-of-life would include having a person saving somebody more than 3 times during dangerous situations and at the perfect timing. Nah I peeked at it because it was like some jokes. For example, somebody be telling you things like, "go outside there's a big rainbow" and then there you went to check it out and there was the disappointment of nothing...not even a raindrop from the sky the entire day so how is it impossible for any rainbow to occur? That's how I felt about all the hypes people be giving me about the whole storyline thing. There really isnt any, or anything newer. There was no actions, meaning a story is just unable to occur.